I'm planning to have a custom seax made for me and I could use some help on the grip. I really would like one in the style of the famous seax of Beagnoth (probably minus the runic script). Unfortunately, the grip of that seax has long since eroded away. Can anyone provide me with an idea of what it may have looked like? I want this to be as accurate as possible for the period. 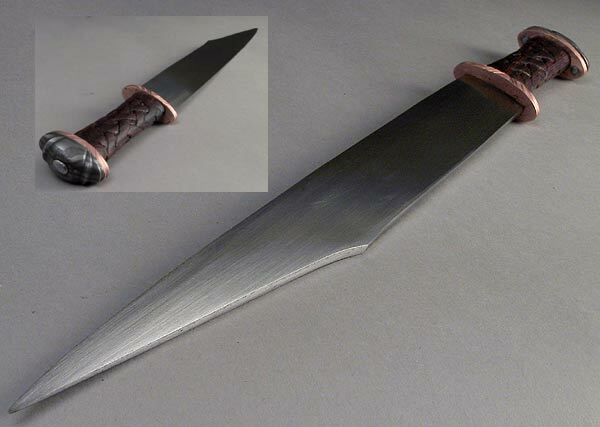 I would also consider another style of seax if I could find a decent pic of one. I'm particular curious about migration era germanic styles since they seem to be the the least well represented in museums etc. Any help would be greatly appreciated. I have no idea... I do know that the blade you posted is the style I'm going to be trying to do for my longsax model. As far as I have been able to find, there seems to be a pretty small amount of information about how these late anglo-saxon seax would have been mounted. Personally I would avoid using any metal fittings to keep it more accurate. If I can ever get around to making one of these for myself, I'm planning on building up from the 8th century sculpture from Repton, Derbyshire. Really it is the only thing I have found which give much of an idea of what the grip would have looked like. I'll include a photo of a sketch of it. It does show the end of the grip swelling, and you know that the front of the grip would have to be easy to slide out of the sheath. As far as cross section of the grip, I would guess at elliptical, possibly with taper to the edge side. Working from this, you would have a firmly based design with room to be creative. For the migration era, are you looking for hand seax size examples or the short sword sax? 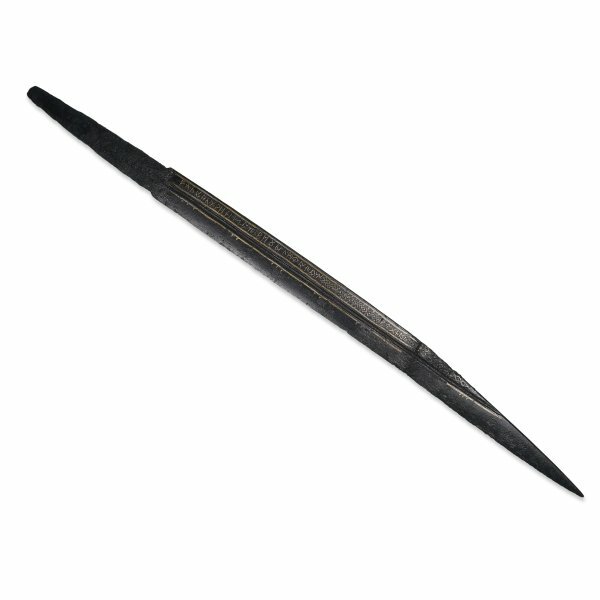 There seem to be several examples of 6th century hand seax found in england with fittings, I'm not sure how common the fittings would be on the continent would have been though. I'll throw in a sketch of a seax from Ford, Wiltshire with silver plated bronze fittings with a garnet setting. Still, my favorite small migration era seax is one which was shown on Netsword a number of years ago. It has the sandwich construction guard of bronze and wood, with the rest of the handle being a carved raven. It is probably still there, if not I have a picture of it saved somewhere. For the larger, short sword types, Oakeshott has a couple of illustrations in AOW. Right off hand I can't think of any good photos of these, although I know they are out there. I'll have to think about it. I've seen a couple of late period drawings that depict the sax with an hilt that tapered in at the middle like an hour glass almost. I can't recall if there were any metal fittings or not. If there were they were the very thin 'washer' style... I bet there is lots of room for variation, though, in getting a seax designed. Thanks for the info guys. I would probably be looking for something in the 12"-18" blade length so I can use it for test cutting like a short sword. I'll check out Netsword for the seax with the sandwich hilt. Found a pretty good picture here... Some examples of the migration short sword types with the grip style not that removed form those of a falcata on the left side. On the far right side then there is an example of single edge viking age sword, at this point it seems simplier to not even call these a seax. These fall into the transition area from the migration to the viking age. One of these days I still also want to do one of these in the sword hilted variety and test it compared to a similar double edge sword. - the seax is a great knife.... good choice !! -either way it is safe to assume that the handle material was decorated with carvings and designs..... since this is very popular with the northern cultures of the time..
Ok, I'm seeing what else I can find to post. For the most part I would agree that rivets holding handle slabs on wasn't used, with the exception of the type pictured directly above on the left hand side. These do seem somewhat more common to have the rivets. Outside of this type I have only found one vague reference to one which might have a rivet helping to secure the handle. Here is another photo of the same seaxs pictured above, only at an angle where you can see the rivets. Looking at the two broken ones in the same box, there looks to be four rivets/rivet holes in the top one and one visible hole on in the bottom blade. Now I would have to disagree with this sites statement that the Celts only used double edged swords, but that is another post. Heck it is looking like I haven't transferred the majority of picture that I have saved over time over to our new computer. there is good indication that some of the larger knives had pins.. very cool stuff !! - I also believe it was a very functional weapon (for everday use and utility too).... seems to be many of them, therefore a very popular item ! Grip construction is typically a knife handle of organic material that is secured by riveting the tang at the protruding end or perhaps more common: by press fit and glueing. Sometimes you see a small pommel or rivet cap at the end of the grip, but that seems not to have been the most common solution. The wide and thin weapons with offset tang we´ve seen pohotos of in this thread belong to another group of seaxes that seem to have much in common with weapons like the Kopis, the Falcata and a later offspring: the turkish Yataghan. They are generally wide and impressive in the blade but quite thin (typically some ?5 mm? at the base of the spine) and makes you think of a short sword when you handle them. Some are more like big kitchen knives, slim and wicked, but perhaps not so effective as cleaving weapons, more like murderous carving knives. There are also those really big seaxes that have blades like Falchions of medieval times, or like very sturdy machetes. These usually have common knife handles: it is rare to find any remains of metal mounts in the hilts. In Norway they developed during the viking age into proper swords (having sword hilts) and we recognize them as the single edged viking sword. In general, the seaxes (with knife grps that are press fit/glued on) that have more narrow blades have also a much thicker spine. The cross section is a substantial triangular wedge. 7-9 mm thick is not uncommon. Sometimes you will se a fuller, but this can in some cases be so narrow and shallow it will not reduce weight much. It seems fullers were usually decorative rather than functional. Incised lines or groves is very common on some types. 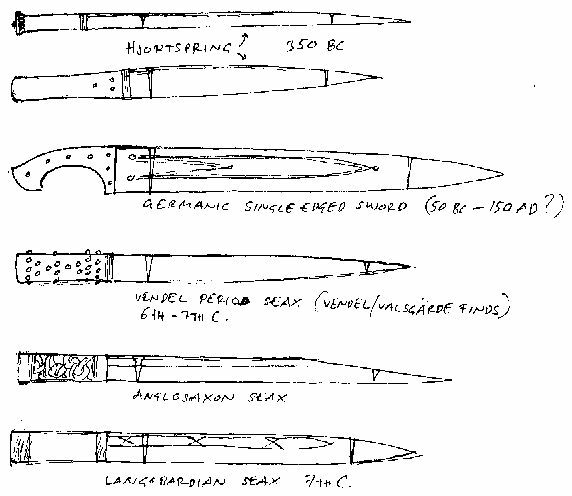 The "typical" seax usually imagined with its angled back and long sharp point is most common in the anglo saxon material. On the continent it seems a less angular profile was more common. The point is usually spear-point-shaped and often aligned along the central axis of the blade. These weapons have a strong blade prescence without being too cumbersome either. Balance is managed bu the mass of the tang and the change in cross section in the blade. Bigger examples often have longer/stouter tangs (leaving room for two hands in some cases). The way these blades are fashioned makes me think of some kind of migration era wakisashi, only a bit stouter. I have seen a few examples when a solid pommel has been added to function like the pommel of a sword. I´ve only seen these on the continental version, with the less angular outline. Outline and cross section follow that of the handle: egg shaped in section and parallel in outline. In other cases there is a more decorative pommel, or rivet block, that is not too far removed in shape from late roman/early migration period spatha rivet blocks: proto three lobe forms. Sometimes with two styilzed animal heads on either side of a central little dome. These pommels are too light to have any effect in counterbalancing. They are just rivetblocks and usually sit of a thin plate that show the shape of the cross section of the grip: egg shaped. 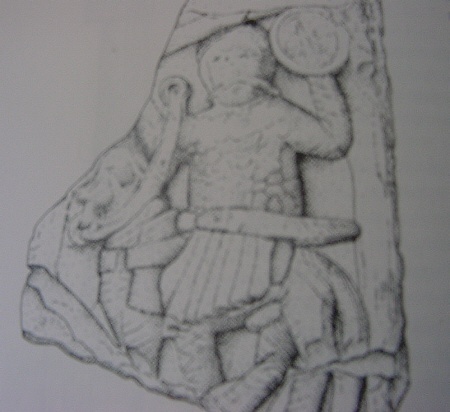 Some of the seaxes excavated in Vendel/Valsgärde have quite a bit of the grips remaining. They are of wood and has decorative domed rivets set in patterns. This must have looked stuning as well as improving the gripping. There are many exceptions to these features. These are just general impressions. This is a seax made as a reconstruction of a grave find in Tomteboda, just north of Stockhom. A lance head, a set of shears, a buckle, a fire steel some small rivets telling of a comb and this seax was found in the grave of a warrior. It was interesting to be involved in the reconstruction of these items as they were all rather far gone from corrosion. Interstingly, the seax had a close parallel in a find from Valsgärde. The grave was dated to the beginnig of the 7th C.
The seax is a bit strange in that the edge has a concave curve. Not much, but noticable. Like a very narrow and almost straight Kukri. It is very thick in the spine and has the heft of a short sword even though its blade is only 40 cm long and some 3 cm wide. The spine is thickest at the point where the "fuller" ends: some 10 mm thick. The grip was reconstructed from remains of wood that was identified as maple and some remains of rivets, that hinted at some kind of reinforcing band had beed secured around the grip towards the end. The tang is not rveted but simply folded over where it protrudes from the end of the grip.